You may have heard about the Memorandum of Understanding between NCIL, APRIL, and the Department of Veteran Affairs’ Vocational Rehabilitation and Employment Service that was developed over several years and released last summer. This MOU may open doors for Centers for Independent Living, but CILs need to make the contacts necessary to begin a dialogue with the VA. In Minnesota, there have been visits with the Fargo, ND and St. Paul, MN regional offices to discuss the MOU and what community-based services a CIL can offer. The meetings were positive and we will see what transpires. I am a Veteran myself and as many of you know, there is a whole lot more to serving Veterans in their communities than just being involved with the VA. We must, as CILs, tell our story about working with Veterans in our communities. It does not have to involve the VA. I have done four workshops the past few years discussing Veterans services, and CILs have a lot to tell. The Association of Programs for Rural Independent Living (APRIL) will post information about your CIL’s work with Veterans on their website. They’ve begun a state-by-state list and you can see some who’ve already posted, but we’d love to hear from more of you. The best thing would be to have info from every CIL in every state. I ask that you send a summary of your CIL’s work with Veterans to APRIL. All you need to do is go to their website www.april-rural.org and click on the Veterans link on the left. You’ll see a spot where you can submit your work. If we can gather enough information, we can assist NCIL and APRIL in advocating for increased funding for Independent Living. Open the MOU Package (PDF) for a list of regional offices and local contacts. 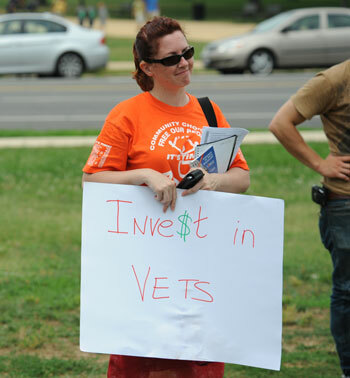 Learn more about the purpose of the NCIL Vets Subcommittee. I am excited to report that Michigan’s CILs have a great working relationship with the DVA. We are delighted that NCIL, APRIL and DVA have developed the MOU. However, we did discover that our DVA/VR&E contacts were not aware of this MOU, which leads me to wonder if other states are in a similar situation. So, I encourage CILs to connect with their Regional DVA offices to share this MOU to start the conversations. We recently experienced some problems with our IL services, which actually led to a termination of referrals for a short period of time. The DVA has strict rules about national contracts, especially as it relates to case management. Our services were terminated on a short term basis because the CIL services looked too close to case management. However, we have redefined the services to be IL/Peer Support Services and have developed a menu of service offerings that I’d be willing to share. We are also in the process of developing an MOU between Michigan’s 15 CILs and the DVA. We are modeling this MOU after the NCIL version. Once that is finalized I’d be happy to share that as well. I will post information to the APRIL website so others can see what Michigan is doing.